Brian Elliott had surgery in the offseason. 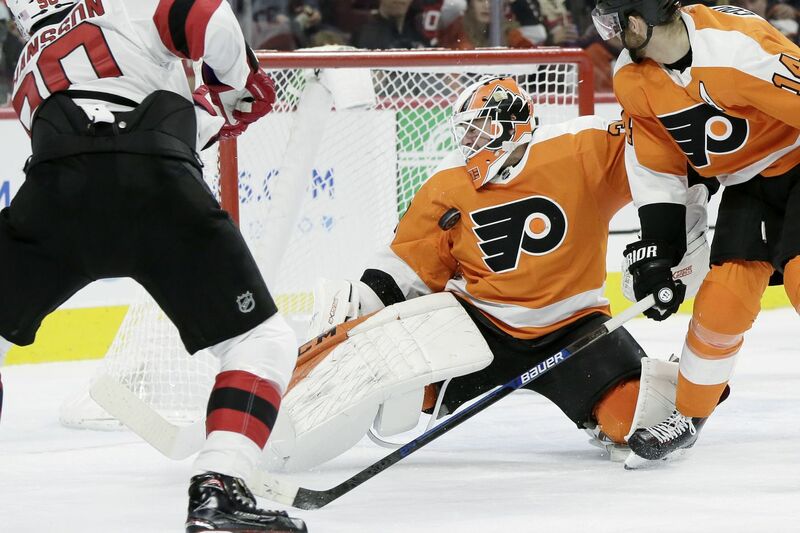 Before Thursday’s game against the Carolina Hurricanes, Flyers general manager Chuck Fletcher issued updates on a slew of players on the shelf. Out with a lower-body injury, goaltender Brian Elliott ``is progressing pretty well,'' said Fletcher. He will return to the ice this weekend, with the hope that he will practice with the team within the next 10 to 14 days. Corban Knight, who also has a lower-body injury, is not expected to return to play until mid to late February. He will see a doctor again Jan.17, said Fletcher. At that time he is expected to be cleared to practice. Andrew MacDonald will miss the next two games with a lower-body injury. Fletcher said he expected the defenseman to be to face St. Louis on Monday. Anthony Stolarz, out with a lower-body injury, may return to the ice as soon as this weekend. Samuel Morin, who is practicing with the Flyers, ``is doing very well after his ACL reconstruction,'' said Fletcher. He has not been cleared for contact. The GM said the defenseman’s hoped-for return remains mid-February. It is hoped that Nolan Patrick (upper body), who participated in the morning skate Thursday, will be cleared for contact by Friday and resume playing next week. The Flyers entered Thursday 25th in goals scored, 28th in goals against, 31st in power play percentage. and 28th in penalty kill. That all adds up to a team moving away from a playoff spot rather than toward one, and moving toward a roster shakeup as well. The coach many of them blamed for this mess is gone, as is the GM responsible for his hiring and the measured rebuilding. What remains, as interim coach Scott Gordon has discovered after a promising 3-1 start to his tenuous tenture, is a team that lacks consistency in all phases of the game, a team that, in his words, ``shoots itself in the foot,’’ a team that lacks scoring punch and resilience despite several talented scorers. The Flyers lost four of five in their recently concluded road trip, including a 3-1 loss the Hurricanes on New Year’s Eve. That was the middle of a three-game stretch in which they scored just twice, inducing Gordon to follow in his predecessor’s footsteps and continually shuffle the lineup. The latest of those shuffles is experimenting with Jake Voracek at the top of the tepid power play and sliding Shayne Gostisbehere into a more conducive shooting position on the side. ``I think we just have to be more responsible. I think we played a pretty good game when we played them. The effort was there. Maybe we didn’t execute the way we wanted to. Back at home here it’s been a while and anytime you’re struggling and you get back at home it gives you a little boost. At one point of that season, the stats did not bear this out. The Flyers had more points on the road than they had at home. But after consecutive disastrous trips to the west and the south, the lesser of their evils appears to be their demanding and increasingly exasperated fan base.